The wolves appear to have disappeared. But everything else is here – from the grisly off-cuts of various surgical operations to a feast of fag ends and a heartbreaking little portrait of the darling daughter who died at the age of seven. Children were always banned from this near-mythical hideaway – and told that ferocious wolves prowled within. Yet, there was nothing anti-child about the occupant. This was where a childlike genius produced some of the most enduring children’s literature of the 20th century. 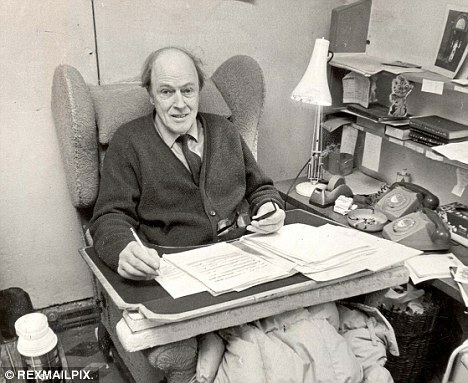 And today, 21 years after he stubbed out his last Marlboro and sharpened his last Dixon Ticonderoga pencil in here, Roald Dahl’s writing hut remains exactly as it was when he died in 1990. No one has even emptied the bin. Among the assorted detritus inside it, I spot a scrumpled sheet of paper with a few scribbles about star signs (which he had planned to develop into a diary for children). 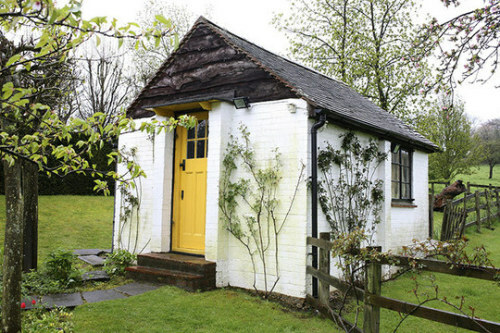 This tiny brick outhouse, at the end of a lush avenue of interweaving lime trees, remains a shrine to the man who gave the world Charlie And The Chocolate Factory, The Big Friendly Giant and James And The Giant Peach. Neither his widow, Felicity – who still lives here at the family home in Great Missenden, Bucks – nor his four children or nine grandchildren have wanted to touch it, let alone give it a good clear-out. Until now. With another winter approaching, the remnants of an extraordinary life – marked with great tragedy and heroism as well as literary success – are starting to deteriorate. The members of the Dahl clan have finally decided that the time has come to preserve the great man’s inner sanctum – or ‘little nest’ as he called it – for posterity. The plan is to remove the interior in its entirety and relocate it to the Roald Dahl Museum which they have founded just down the road. But it is not going to be cheap. Indeed, at £500,000, the cost might seem as fantastic as the plotline to, well, Fantastic Mr Fox. Even here in this leafy, half-timbered corner of the Chilterns, surely property prices have not got so ludicrous that it costs half a million quid to shift a glorified potting shed? Yesterday morning, there were gasps of incredulity within minutes of the launch of a public appeal, on the BBC, fronted by the author’s model/writer granddaughter, Sophie Dahl. Angry emails came pouring in. How could a hut cost so much? And why couldn’t the literary estate of an international bestselling author – published in 49 languages – stump up the funds? By yesterday afternoon, the debate stretched from the web pages of the Los Angeles Times to Taiwan. So, what is all the fuss about? And does it really require so much money? No sooner have I stepped through the door (well-guarded with hefty Banham locks and a security grille) than I sense a certain aura. And it’s not just because I am inside Britain’s costliest bothy. There is an inescap-able sense of entering the creative bolthole of a literary giant. And it is all engagingly barmy. The hut, constructed by a local builder in the Fifties, is built of a single layer of bricks and lined with poly- styrene. 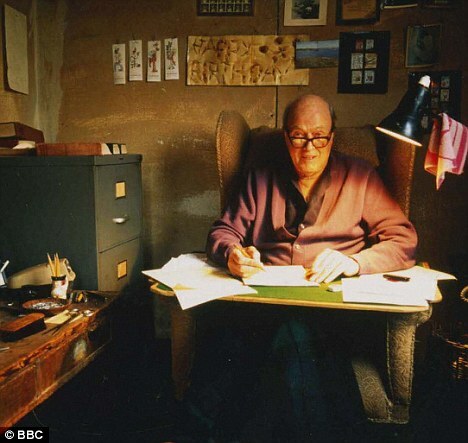 A small ante-room contains the filing cabinets in which Dahl locked away all the drafts of his books and screenplays, and the remnants of various hobbies. In later life, he developed an obsession for picture-framing. Dozens of ornate frames hang on pegs, awaiting a picture. An open doorway leads into the nerve centre. Commanding the ‘room’ – it is about the size of a modest ship’s cabin – is an ancient wing-backed armchair which belonged to Dahl’s mother. An extra cushion was added by him to aid the bad back which was a lasting legacy of a crash-landing during a stint as an RAF fighter ace in World War II. When he later developed an abscess in his back, his response was not to get a new chair but to hack a hole in the back of it to accommodate the sore. The hole is still there. Alongside it stands a table of mementos, some curious, some grotesque. There is the hip bone which Dahl retained after a hip replacement and a little jar of spinal shavings – another souvenir from that RAF crash. On the opposite wall is a filing cabinet with a bizarre lever wedged into a drawer handle to make it easier to open. This charming artefact, it turns out, was his original hip replacement – itself replaced in a subsequent operation. Hovering above the chair is a truly terrifying bit of DIY – a single-bar electric heater dangling from a couple of wires on what look like a pair of coat hangers. Depending on the temperature, Dahl would pull the thing closer or push it away with a walking stick. Given all the polystyrene on the walls, the constant cigarettes and this red-hot contraption hovering overhead, it is a wonder he didn’t go up in smoke. All over the walls are family photographs and miscellany. Children may have been banned, but their cards and letters were lovingly impaled on the polystyrene with twisted paperclips (for some reason, Dahl preferred these to drawing pins). Unsurprisingly, perhaps, the most obvious images are those of Olivia, Dahl’s eldest, who died from measles encephalitis in 1962 at the age of seven. Also on the wall is a tiny ‘WDT’ valve, used in the treatment of hydrocephalus (water on the brain). Dahl, who was interested in engineering, helped to develop this widget after his son, Theo, was hit by a New York taxi in 1960 and ended up in intensive care. As well as achieving literary immortality, Dahl acquired a medical renown of sorts. The ‘WDT’ valve is named after its three inventors. The ‘D’ stands for Dahl. A psychoanalyst would have a field day in here. If Dahl hated his schooldays so much, as he claimed, why are old photographs of his alma mater, Repton, on the walls? And why did he reject a writing desk in favour of this green baize board shaped to fit around his waist? It would sit on a roll of corrugated paper laid across his legs. His feet, meanwhile, would rest on this old travelling trunk full of logs and nailed to the floor. The whole thing looks like a home-made replica of a long-distance aeroplane seat. Does this show a subliminal hankering for his pilot days? ‘It certainly has the feel of a cockpit,’ observes Amelia Foster, the director of the Roald Dahl Museum. She is thrilled that all this will be relocated to her award-winning museum. And she points out that it is a painstaking process. While the brick exterior will remain in the garden, the interior will have to be extracted by experts to prevent the cracked, nicotine-stained polystyrene walls from falling apart. But what about the £500,000 cost? ‘It is a very expensive business. But no one has ever seen this place before, and we want to share it with future generations because that is how you inspire young people,’ explains Amelia, a child literacy expert. As for criticism about the fundraising, she insists that neither the museum nor the family is holding out a begging bowl. The Dahl family, she points out, have already contributed around £250,000 of the money required, while it is the author’s literary estate which keeps the museum solvent and buzzing – and also funds Roald Dahl’s Marvellous Children’s Charity for seriously ill children. This is certainly no ordinary shed. And every child – or former child – who has ever been touched or captivated by this curious man’s creative energy should be fascinated to see where it all happened. DIY enthusiasts, meanwhile, can come and marvel at the price. This entry was posted in anglophilia, kid lit, writerly lives. Bookmark the permalink.